Start off the New Year with a Hike. 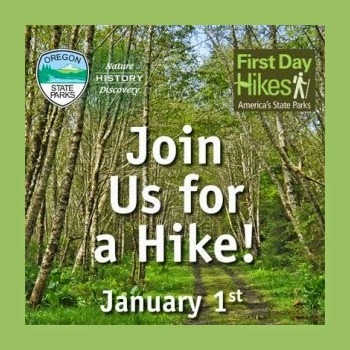 January 1st, 2015 First Day Hikes will hosting hikes at two Columbia River Gorge locations. One First Day Hike will take place at Historic Columbia River Highway State Trail from 10:30 a.m. to noon. The other Columbia River Gorge Hike will take place at Rooster Rock State Park from 10:00 a.m. to noon. Read about First Day Hikes below and we hope to see many Columbia Gorge Hikers in the New Year. The only things you’ll need for the 25 other hikes are appropriate clothes for the weather, sturdy walking shoes and drinking water. The hikes are free and day-use parking fees are waived Jan. 1 for all visitors to participating state parks that normally require a permit. This is the third year that Oregon State Parks has participated in First Day Hikes, a nationwide initiative sponsored by America’s State Parks (www.americasstateparks.org) to encourage people to enjoy the outdoors and celebrate the New Year by getting out for a walk in a state park. Last year, more than 420 people participated in First Day Hikes in Oregon.